I’ve been on a button kick lately. And now that I’ve made as many hair accessories with buttons as I possibly can, I’m moving on to pants! (OK, I also discovered that my daughter’s been removing her hair clips and admiring them during class and getting them confiscated. So I had to put them somewhere she couldn’t get at them). Forty bucks. I bought some plain girls’ jeans on sale for $10 and added buttons I already had (you can pick them up at JoAnn’s or Michael’s for around $3 a packet). I laid out the arrangement first and took a picture with my cell phone so I’d remember where I placed everything and then sewed them all in place. Bam! It took about twenty minutes from start to finish and adds a nice little something, I think. I also embellished a pair of khaki pants. I bought our pair in the kids’ department at H&M for $12 but you can find them anywhere. You could even buy khakis in the school uniform section and embroider them up. I used two strands of embroidery floss to sew on the buttons and three strands for the embroidery itself. The only real tip I have for embroidering is to sew small. If you think you can make a flower in two stitches, use four. I outlined the pockets of the pants as well. My daughter asked for butterflies on the other leg, at which point I broke down and bought some appliques at JoAnn’s…because my mad embroidering skills don’t extend much beyond the flowers you see above. I just realized that before I started all this sewing, I forgot to actually have my girl try these on to make sure they fit. Huh. I’ve got a few shirts on-hand that I’m going to work up next week, so stick around! oooh, that’s a great idea! 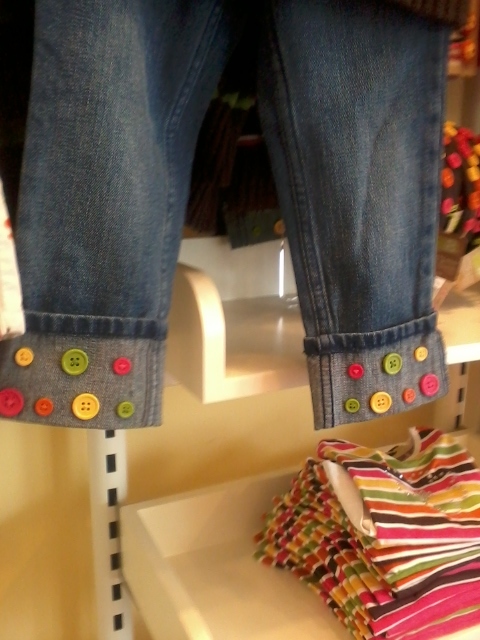 They also had boy appliques at JoAnn’s (firetrucks and motorcycles and things) so when the jeans get to him you could sew one or two on like patches…or on a back pocket, maybe.